I need you -- oh how I need you! Do you think Yves Saint Laurent had that song in mind when creating their signature Baby Doll fragrance? Who knows ... but whatever made the famed clothier create such a sweet-smelling perfume, let's thank our lucky stars for finally finding the perfect present for Mom! 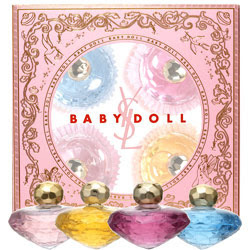 And this year, you can give her the fragrance four times over with the YSL Baby Doll Collection. A delightful and whimsical mix of floral and fruity notes blends together to create an almost magical aroma (in this beauty chick's mind, anyway!). Start with grapefruit, rhubarb, peach and pomegranate ... add in some wild roses, freesia and cedarwood ... finish off with spices like red currant, cardamom, cinnamon, ginger and grenadine ... and you've got yourself one perfect fragrance. Housed within four glittering faced crystal bottles -- each in the shape of a spinning top -- is a girlish and youthful yet sophisticated and precocious scent, made even more so with a beautiful golden stopper. Note: This collection is no longer available.